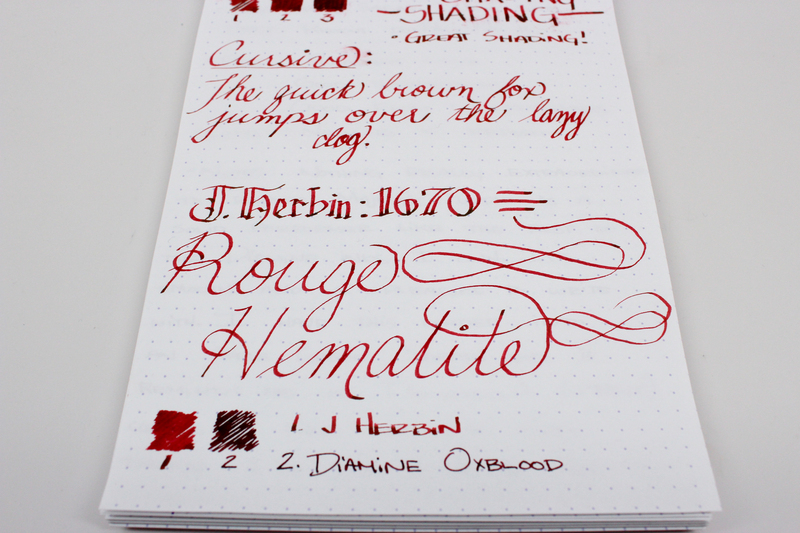 Notes: J. Herbin’s 1670 Rouge Hematite. That is a mouthful, but such an impressive ink deserves an equally impressive name. 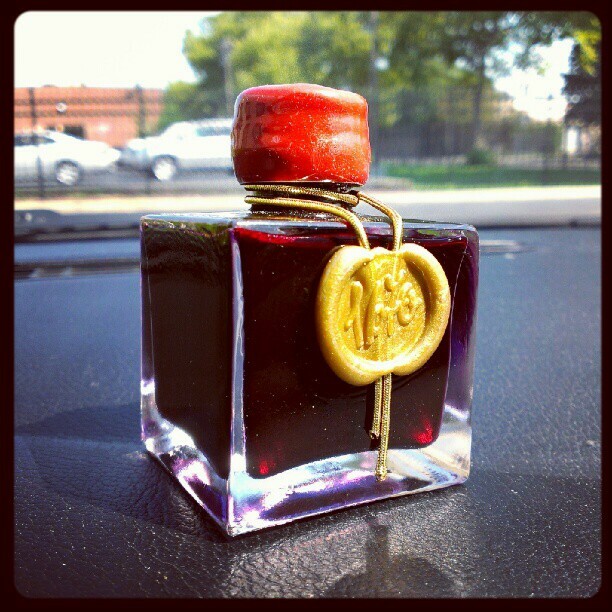 This ink was released for the 340th Anniversary of J. Herbin. Wow. 340 years of ink manufacturing is absolutely crazy. There are few things in the world that can say they’ve been doing something for that long. The ink itself is really, really nice to look at and write with. Rouge Hematite can be roughly translated to “Blood Red”. Going back to the days when I had a rock and mineral collection (I was eight years old, cut me a break) there were several pieces of hematite in my collection. Hematite is a dense, very dark grey stone that when polished gives off almost a black chrome appearance. This ink is not to be confused with the mineral. The Greeks used the word hematite for blood, and the color sure does look like it. 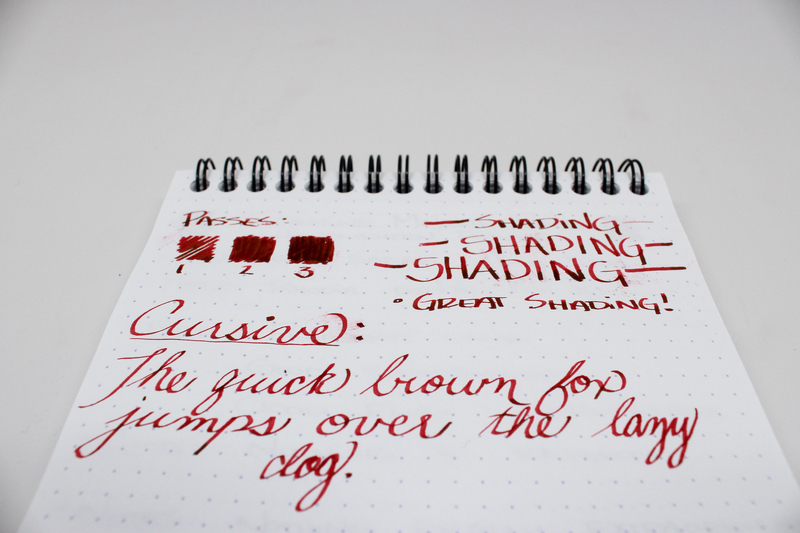 It’s a deep, dark red with great shading and a golden sheen. Initially, it was this golden sheen that had drawn me to the ink, on top of that it’s blood red. Really, what more could I ask for? There are a few things about the ink that I don’t necessarily like, but they are easily overlooked when seeing the final product. See what I mean? It’s stare-worthy. The ink dries pretty slow, and with Rhodia or any slicker paper, the ink doesn’t really like to stay put. If some smearing on the page (which is practically inevitable unless you’re surgically precise with your writing and hand position) and some red-stained hands here and there bother you, I would suggest checking out a sample before committing to an entire bottle. Which brings me to the bottle. It’s looks absolutely stunning. It’s taller than J. Herbin’s other ink bottles, and much more square. It has a golden ribbon that’s held down by a gold wax seal. The cap is coated in red sealing wax as well. The bottle is a great piece to have on my desk along with my other more visually pleasing bottles. The only thing about the bottle is that the mouth isn’t very wide, and pens with a thicker grip could have trouble filling. It’s a small trade off, plus, it’s up to the Germans to provide form and function, the French just make everything look pretty (from a design standpoint anyway). Enjoy the review, this is an ink I always have in at least one of my pens. 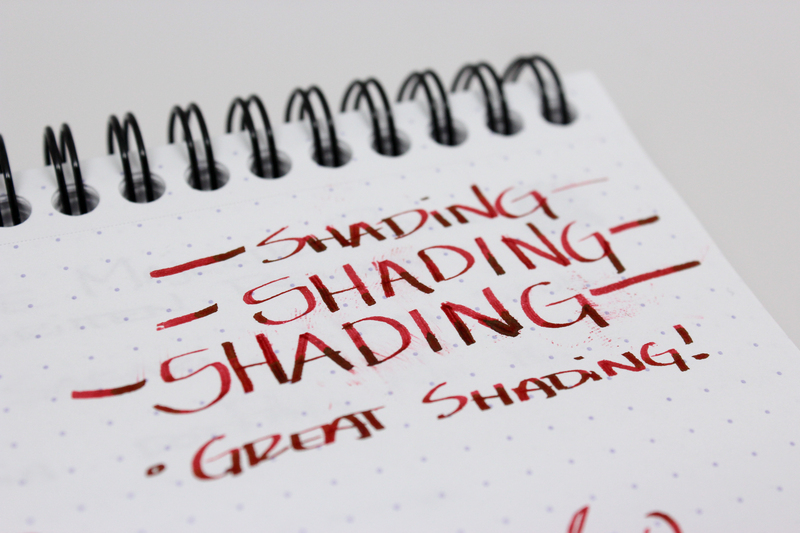 Great shading here, however be careful with a broader nib. The dry time can be pretty long depending on the paper. 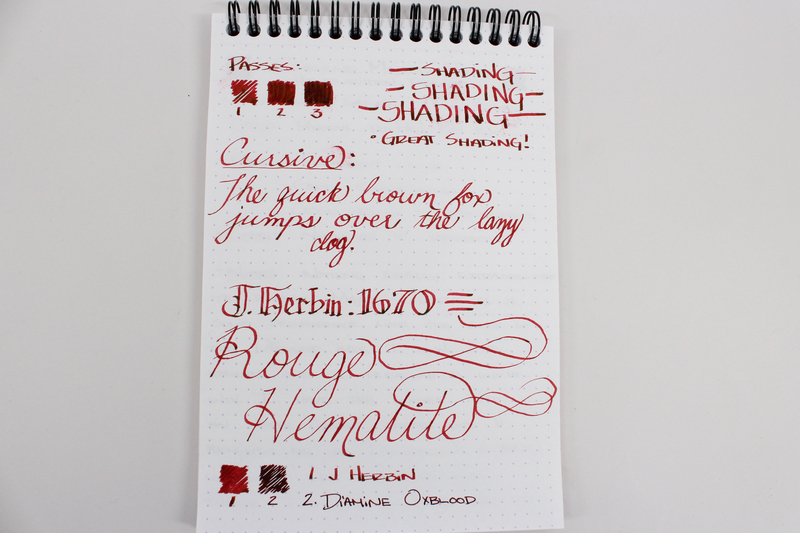 I opted to compare my other blood red ink with this one. While oxblood is much darker (perhaps a less oxygenated blood), Rouge Hematite is a brighter shade of red with less blue and more yellow. Either way, they’re both great inks. It’s much more impressive in person too. Such a great ink! I looove this ink! I know some people complain that it’s “sticky” but I don’t even care. And it looks awesome in a clear pen. Like a TWSBI. … With stub nib! I can get why people would call it “sticky”, but it’s totally worth it. The ink could self destruct after 24 hours and I’d still probably write with it. Funny that you mention it, I have yet to put this in a demonstrator! Now I think I have to. Me too, it’s a great color! I recently got a bottle of the Bleu Ocean, and while it doesn’t have shimmer, it’s a great saturated blue. I’ll have a review up of it this week! I realize this is an old review, but I’d like to share some of my experience. 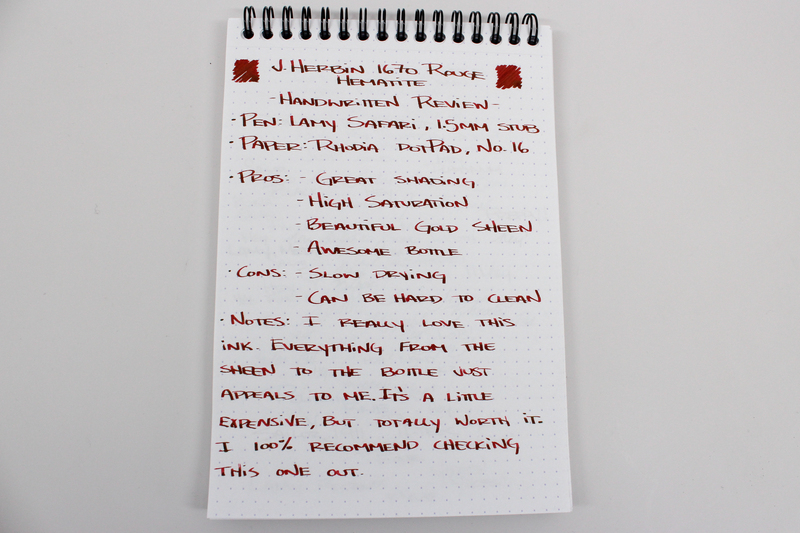 I found you blog looking for Herbin 1670 ink reviews. I’ve used this one for quite some time and I love it. My only problem is, that I used it in my very reliable aluminum rotring esprit pen and it turned out to be corrosive. I couldn’t find anything about that online, but the ink kind of ate the material. I switched to a cheapish Pelikan pen and it works great. I’d really love to try the new Emerald of Chivor ink but I’m not willing to destroy another pen. Did you observe any negative effects on any of your pens? No negative effects to be reported. I’ve had the Emerald in my stainless steel Lamy 2000 for around 2 months, cleaned out easily and no damage. I think your experience was mainly due to the fact that the pen was aluminum. That material can easily get messed up by various inks due to its prone-ness to corrosion. I’ve been wondering about this ink for quite a while now. After reading this review and looking at the writing samples, I realize I will have to buy a sample or two and try it out in some of my stubs, among other pens of mine. I love a good red, and this seems to be an exceptional red!